Holding the gift from the Duke Foundation are (l) SMWC Vice President for Advancement and Strategic Initiatives, Karen Dyer; District Manager for Duke Energy, Rick Burger; SMWC President Dottie King, Ph. D.; Indiana Wildlife Federation Executive Director, Emily Wood; SMWC Director of Facilities, Josh Wood; Duke Energy Director of Environmental Affairs and Stakeholder Engagement, Dan Weiss; and Indiana Wildlife Federation Habitat Programs Coordinator, Aaron Stump. Saint Mary-of-the-Woods College’s restoration efforts around Le Fer Lake is receiving support from statewide partners. 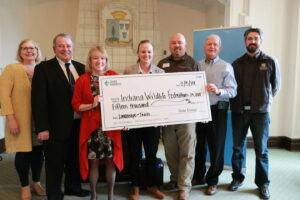 Duke Energy Foundation has awarded the Indiana Wildlife Federation (IWF) a $15,000 grant to assist in the creation of an outdoor laboratory on Le Fer Lake, a welcoming natural habitat for a diverse set of wildlife on the Saint Mary-of-the-Woods College campus. The award was presented on Tuesday in an event on campus attended by staff from Duke Energy, Duke Energy Foundation, IWF and SMWC, led by President Dottie L. King, Ph.D.
IWF —an organization working to promote the conservation, sustainable management and sound-use of Indiana’s wildlife and wildlife habitat— will provide materials and expertise to the College through this project for landscaping using conducive methods and plants native to the area. In the end, it will serve as a venue for research and learning for SMWC’s students and scholars in life-science education, environmental education and other science and sustainability programs. “Our ability to fulfill our mission to help wildlife relies entirely on our capacity to reach, engage and link together diverse partners across the state. Through projects and programs like this we are able to unite schools, businesses, government agencies, non-profits and individuals in the conservation actions that will help us protect and preserve Indiana’s wildlife for generations to come,” said IWF Executive Director Emily Wood. This support brings SMWC one step closer to completing the restoration work it began around the lake several years ago. Last year, a milestone in this effort was reached with the opening of a walking trail around the lake followed by the addition of picnic tables and benches made of plastic caps collected by the students through SMWC’s Caps to Benches project. In October 2018, SMWC became Indiana’s fourth IWF certified sustainable campus. The College received the Landscaping the Sustainable Campus certification, a voluntary program designed to manage runoff, excess nutrient pollution and add quality habitat space for wildlife on a college/university property. In July, upon completion of a trail enhancement project in Le Fer Lake Trail, SMWC received the Sustainable Trail Certification from IWF. The certification program encourages the development of trails into thriving habitat corridors. SMWC Director of Facilities Joshua Wood has been driving the certification efforts at SMWC. He is also instrumental in the partnership with IWF. He says he is motivated by the campus’ breathtaking beauty and the desire to protect its rolling landscapes. Supported by partnerships with Duke Energy Foundation and IWF, SMWC’s outdoor laboratory could be a shining example for others. SMWC embraces sustainability as one of its core values. Emily Wood said IWF is grateful for organizations like SMWC for prioritizing sustainability and conservation. “Your college should be incredibly proud of the initiatives which intentionally make space for nature, strive to be good stewards of your campus’s natural resources and above all else you invite your students, faculty, staff and guests to be an active part of that belief,” she said.